Sports is a huge industry. It is an integral part of our existence. Whether you are a world-class athlete or just an ardent fan of soccer, you can’t imagine life without it. The number of websites and applications dedicated to this sphere are convincing proof of that. From simple blogs to mobile fantasy programs, there are many ways to get closer to your favorite sport. If you need to create an UI according to this theme, we are ready to provide you with some free sport icon packages for inspiration. As a rule, such sets cover the same range of objects; the only thing that is different is design. You can stumble upon professionally visualized equipment, clothes, accessories or attributes for the sports enthusiast. Our collection concentrates on a realization rather than contents, since artists come up with quite original solutions. From lavish fully illustrated scenes to primitive yet distinct single-line shapes, we try to embrace various examples. Sports Icons – Nucleo by Sebastiano Guerriero demonstrate how to skillfully use a simple two-tone color scheme, line style and a minimal details. Each glyph is understandable and pleasant to the eye. Outline Icons by Ricardo Salazar are tailored to clearly envisage elements inherent to popular games and enrich the UI. A line style in tandem with monochrome coloring provides each pictogram with a well-groomed and stylish appearance. 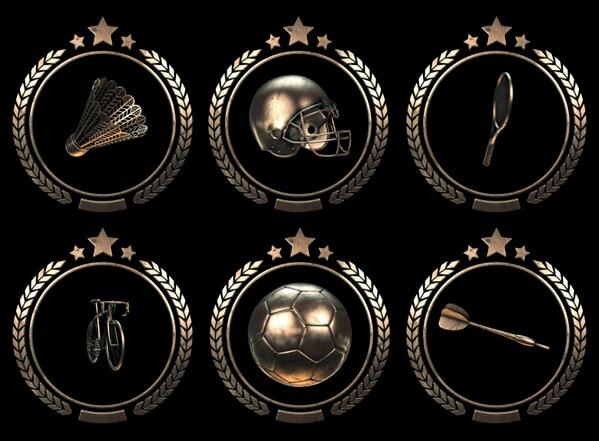 Sporties Icon Set by Creativedash is a free version of the premium package. The collection is dedicated to famous sporing events. It showcases basketball, volleyball, golf, cycling, darts, rugby and others. It is available in three formats (AI, PS, and Sketch) and three styles (stroke, solid and colored). Sport Icon Pack by Polyarix is a collection of free well-executed outlined objects. They are static, however, some items have a dynamic touch. Each is a vector shape presented in EPS format and one style. Each three-dimensional rendering shines and shouts at you. Neatly treated glossy surfaces in tandem with golden coloring give the package a luxurious feel. Subtle motion is used to charge items with energy strengthens an impression. 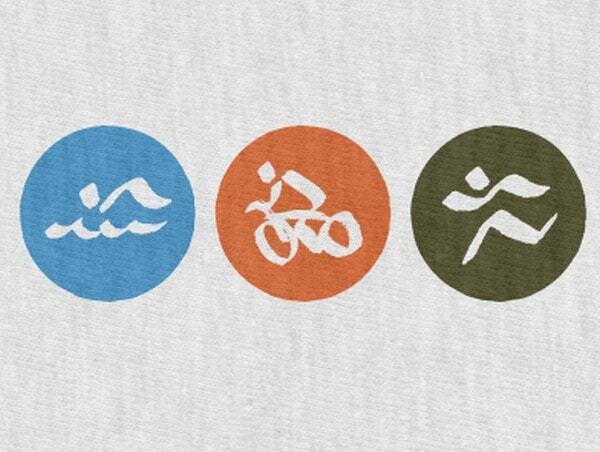 Sport & Fitness Icons by Dan Fleming look neat, tidy and elegant. A beautiful three-tone color palette provides each glyph with a vivid and lively appearance as well as naturally highlights distinctive details. The line style carefully outlines each object, making it look trendy. 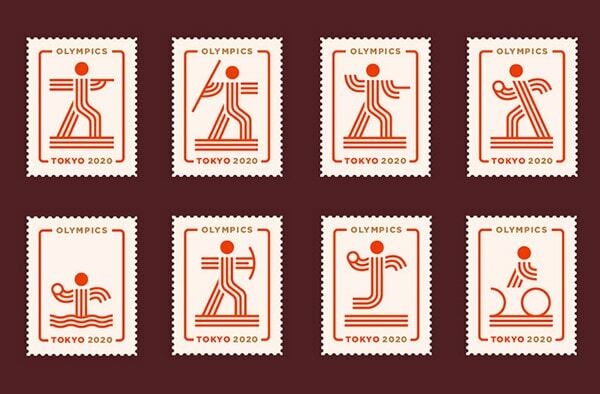 Tokyo 2020 by Martin Azambuja features icons that are made in a shape of post stamps. Getting its beauty from line style, minimalism, artistic feel and powerful Olympic vibe, these 20 exquisite pictograms stand out from the crowd. The artist clearly illustrates javelin, fencing, volleyball, cycling, handball and others. The project seems to be a fresh take on the Art Deco style. Line art and monochrome coloring together with negative space delineate each object and make glyphs look original and intuitive. 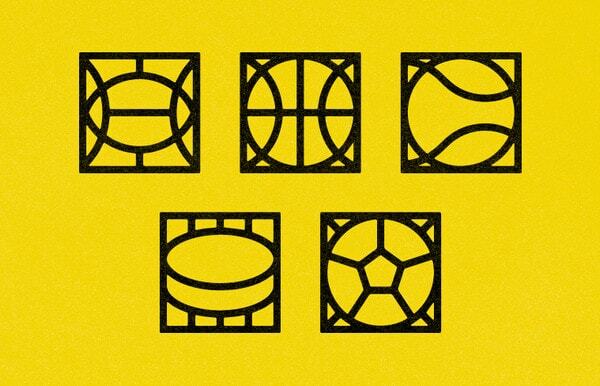 The designer successfully portrays balls for football, tennis, basketball and rugby and a hockey puck. Activity Line Icons charm with minimum details. Ion Popa opts for distinctive characteristic traits as well as choose only one color to visualize the object. As a result, each pictogram has a subtle, delicate and intricate appearance. App Icon Sketches by Loggia intrigues. Warm coloring brings positive emotions. The project is dedicated to betting app so that the artist skillfully combines a visualization of a kind of sport and the program’s concept. Although this is only a draft, it is very interesting to explore. The project features a fresh and original way of portraying sports activities. Remo Bang uses a line style, smooth curves and soft two-tone coloring. Each pictogram is composed of vital details that effectively get across an idea. 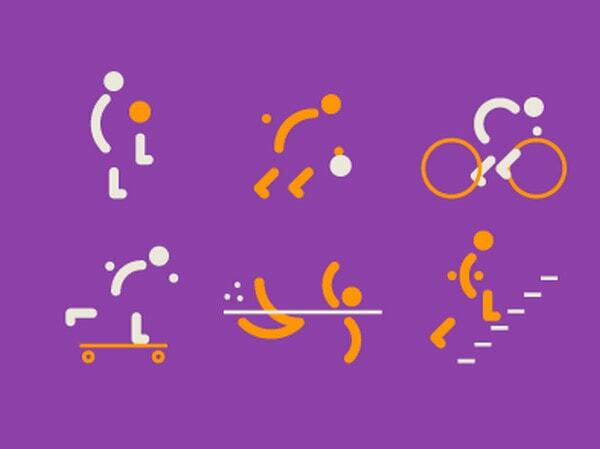 Sport Icon Set includes tiny, yet highly detailed, illustrations made in a flat style with vibrant coloring. The collection covers popular sports such as hockey or tennis and board games like chess. It is available free, so that download it and use for your purposes. ESPN – Sport Icons by Loris F. Alessandria are bursting with an energetic vibe. The artist leverages brand colors and trendy flat style to create each glyph as well as properly reflect the atmosphere. The project includes objects that are symbolic for sport events. This is another elegant and crisp outlined variation of sports icons in our list. They look tidy, clean and modern. Alex Pronsky shares with 15 items in PSD format. Indoor Sports by MUTI is a small collection that includes three small, yet sophisticated flat illustrations. Each icon is quite schematic since the author does not go into details. 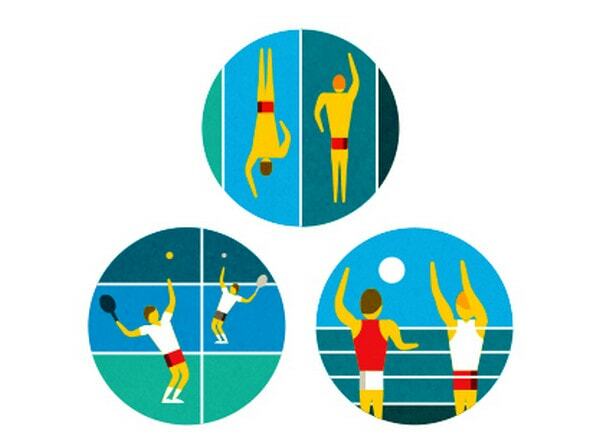 They depict volleyball, tennis and swimming. The project represents sports in a clever way. Inka Mathew uses only characteristic traits that uniquely identify activities. Each glyph has a wonderful calligraphy touch that lets the pictograms radiate refinement and elegance. This massive collection of splendid, vigilantly crafted pixel-perfect pictograms describe sports from different angles. The author mimics some glossy touches and even adds a subtle sense of motion to some elements. The set embraces various categories from kayaking to urban skateboarding. Sport Icons by Yaroslav Zubko are sleek, neat, pixel-perfect and intelligible. The bundle includes symbols that exemplify various sides of sports starting from a subtle contour shape of a coach and ending with a solid shape of a stadium. It is also available free of charge. The collection includes more than 20 vector shapes that illustrate various activities. Each glyph is high-quality, so it remains sharp and legible regardless of size. The freebie is available under CC 4.0 license and contains two versions (line and solid) and two formats (AI and EPS). You can go for an illustrative approach that will charm users with a realistic picture, bright coloring and plenty of details, or, on the contrary, opt for minimalist outlined pictogram that will describe objects in a refined and crisp way. What package do you find the most impressive? Do Olympic-themed icons or icons that are composed of several tiny lines grab your attention? Let us know in the comments.